A Power of Attorney can either be general or bounded to a particular purpose. When the principal or donor authorizes a party, who is an attorney, a power of attorney takes up the act on the donor’s behalf. A general power of attorney simply means that attorney holds a general power regardless of the subject matter. Similarly, the principal party holds absolute rights to manage even after the General Power of Attorney Form Samples is appointed. This does not mean transferring the rights to the latter. A General Durable Power of Attorney Form comes into picture when the principal party considers or specifies durability factor in the need. This means the power of attorney will remain effective in the place where the power of the principal party becomes insufficient. Failure to specify the durability leads to cancellation of the attorney’s power if the principal party is incapacitated. 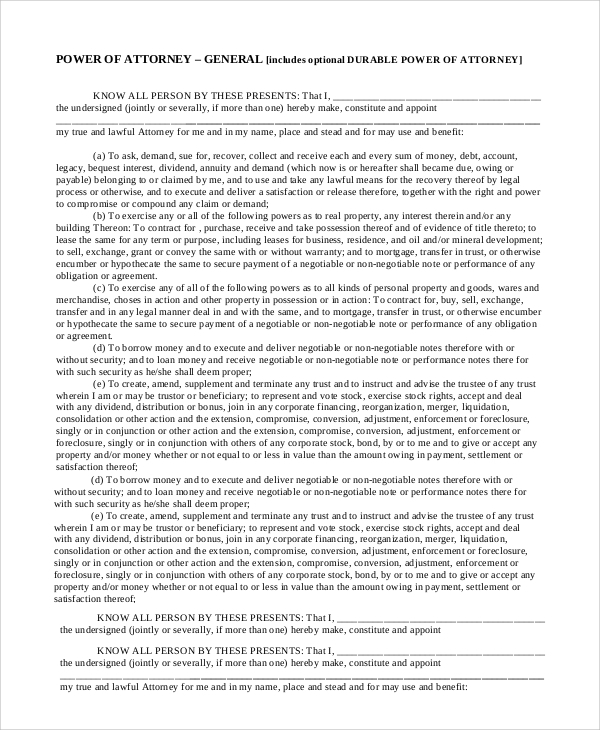 A General Power of Attorney Form is suitable for the party who wishes to transfer all the property rights and responsibilities from one individual to the other. This form is used when the principal party is unable to handle or manage the assets or find the possibilities that it could become unmanageable in the future. 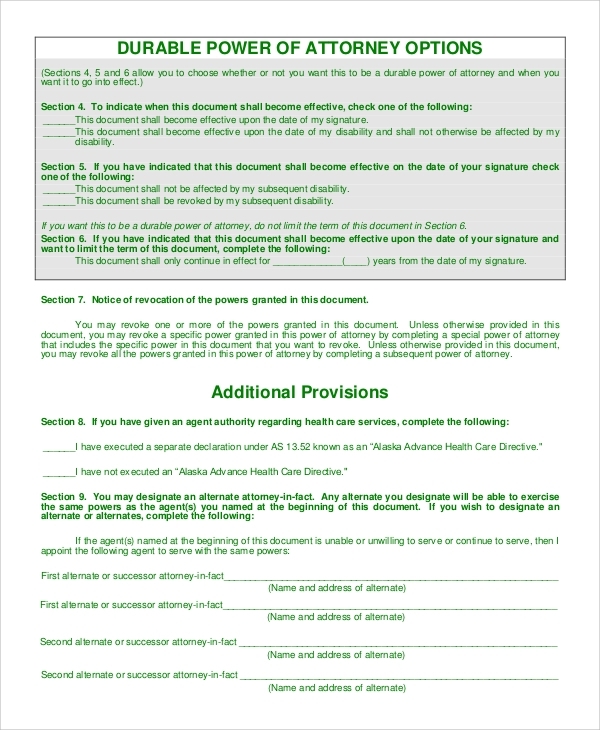 The exception says that this General Power of Attorney Form doesn’t connect anywhere for medical use. 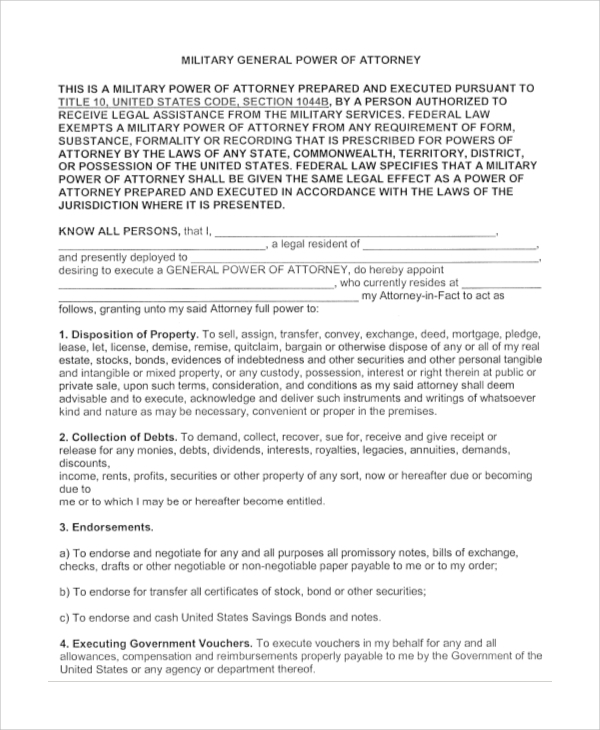 A Military General Power of Attorney Form is used when the principal party, which is to be represented is in the military and wants to grant authority to a friend or any family member due to the training purpose. This may require travel or a stay at a base away from home or a condition where the principal party is deployed overseas. Similarly, if you are married to a military person, you hold the right to file a General Power of Attorney Form for your spouse to sign, which grants you the authority over his legal or financial needs. What is Revocation of Power of Attorney? If the durability factor is mentioned in the deed, the revocation of Sample Power of Attorney Forms is easier. The revocation can happen by the principal party giving written notice to the agent. The interested party is supposed to send a petition to the court alleging that issue or sign the revocation on papers, in front of a notary public and deliver it to the respective parties. The revocation is expected to take place in the same place at the respective country recorder’s office where the Power of Attorney was recorded and give the attorney his powers to represent the principal party legally. 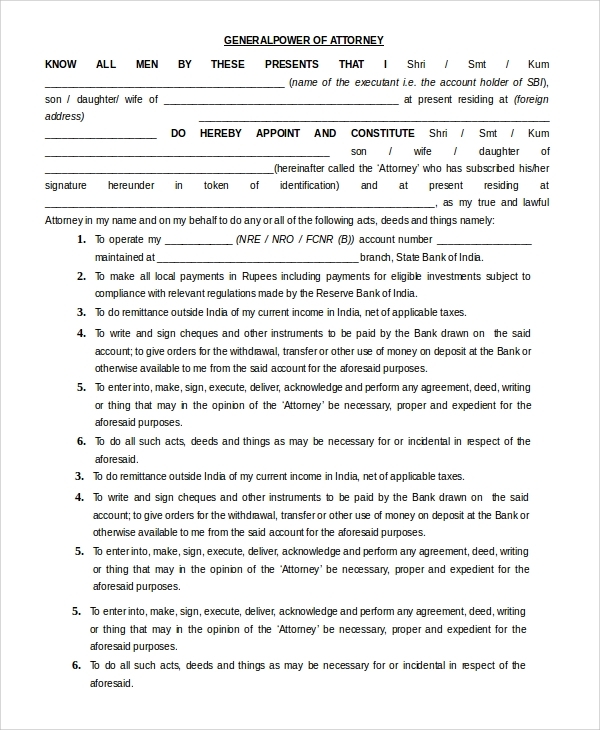 In this kind of General Power of Attorney Forms, the principal party confers the power to the approved Attorney to act on his behalf for a specific purpose and the power ceases if the Attorney crosses the bounded purpose or the purpose is over. In simple words, the attorney here is narrowed to the choices he needs to make. Among the several types, the general power of attorney financial or simply called as Financial Power of Attorney is a particular type wherein the principal party authorizes the power of attorney to act on his behalf only on financial matters. 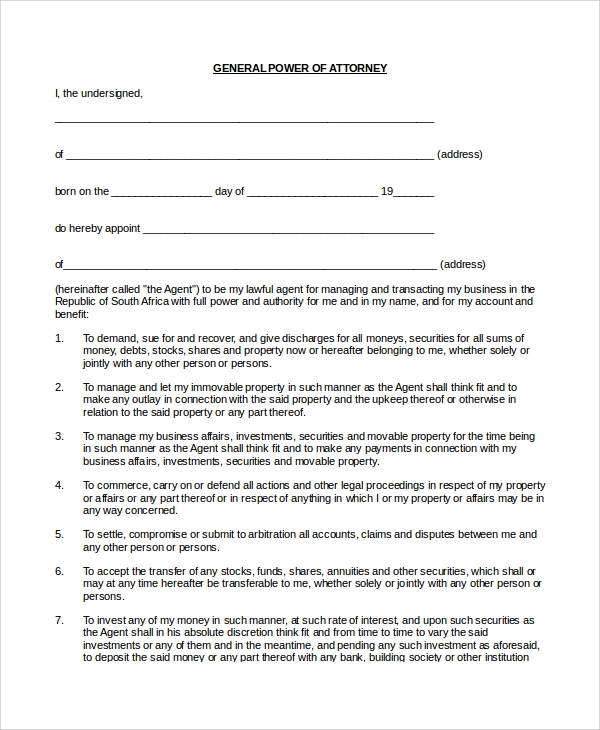 This is one kind of special power of attorney. 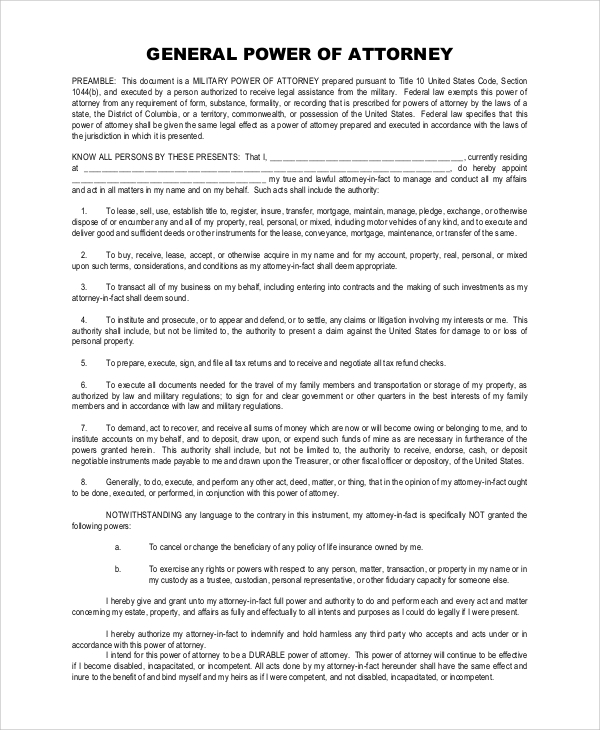 As said, in this kind of General Power of Attorney form, the attorney’s power ceases to exist in different matters on the same principal party unless approved. When does the General Power of Attorney take effect? 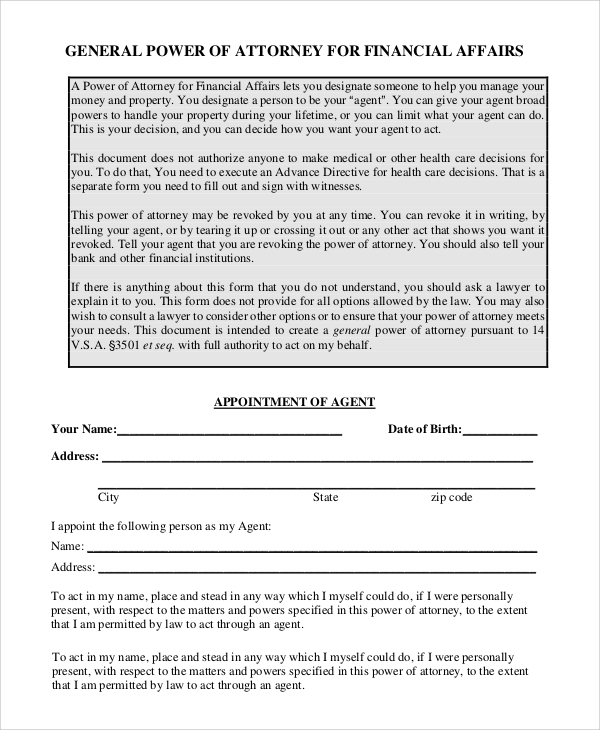 Depending upon the signed General Power of Attorney, a General Power of Attorney can either be effective immediately or upon the occurrence of an event. However, a principal party doesn’t authorize an attorney as long as he can act for himself. When the condition is like this, the attorney’s power will be effective with regards to a particular event, and then it is called a springing power of attorney. The most common future event is the incapacity of the principal party unless the event is specifically mentioned in the deed. Here, the incapacity of principal could refer to the principal becoming mentally or physically unable to make decisions. Your agent, who is the General Power of Attorney, depending on what you say in the form, can represent you in any matters like transactions, benefits, claims, securities, deposit box access to gift to charities. 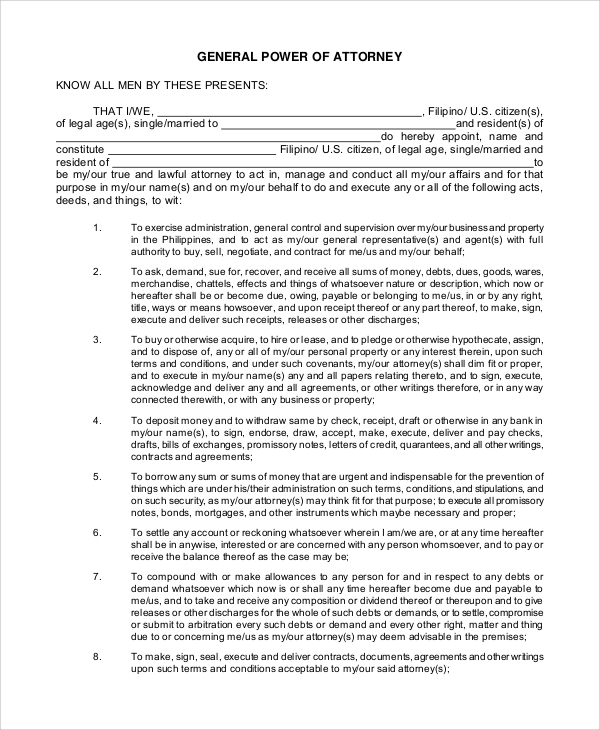 But before that, signing a legally right Medical Power of Attorney Forms is mandatory.